Big news: I’ve just completed a life goal I’ve been dreaming about for years. 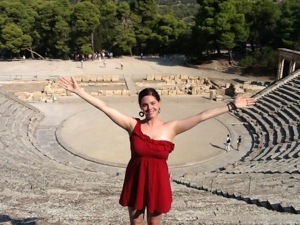 I have just been to Epidaurus. IT IS EPIC . Epic is the only and ideal word to describe this breathtaking place…. Having a somewhat biased opinion due to my passion for the theatre, I am in no way exaggerating its staggering beauty. The effect it has is overwhelming, stunning you senseless and blinding you with beauty. You complete the climb up the rocky stairs to the top, shaky and breathless, and collapse into a tired heap. You sit there, exhausted, admiring the scenery, attempting to take it all in. Epidaurus was originally a sanctuary of Asclepius, the god of medicine, and was known as a miraculous healing sight. Visitors would come from far and wide seeking cures for their ailments. However he also used it as an entertainment venue, one that is still in use today. 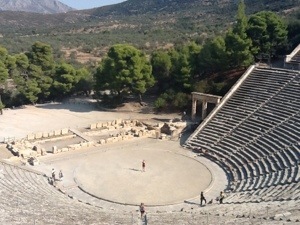 The Epidaurus festival, part of the annual Hellenic festival, focuses on the recreation of classical Greek Theatre and stages numerous plays each year within the ancient site. 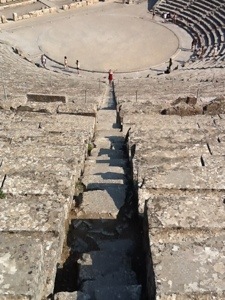 The Theatre was built in the 3rd century BC and can hold 14,000 spectators. It is built out of limestone rock and is incidentally famed for its amazing acoustics. You can literally drop a penny in the centre and the person in the very last row will hear it. It is also surrounded by a lush landscape of trees and mountains, which was common in Greek Theatres of the time and is an integral part of the site. I could not imagine anybody, thespian or not, to not be truly awed by this ancient site and taken aback by its breathtaking beauty. From the bottom of my heart I recommend this as a sight to see in Greece. 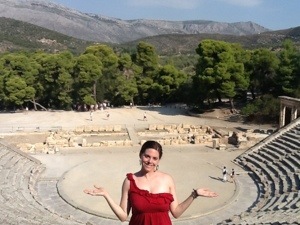 Even better- come during the festival and see an ancient Greek play being staged here!